Thompson & Thomas, Famous Pictures by Renowned Artists, Chicago, 1902, Illustrated pg. 40. 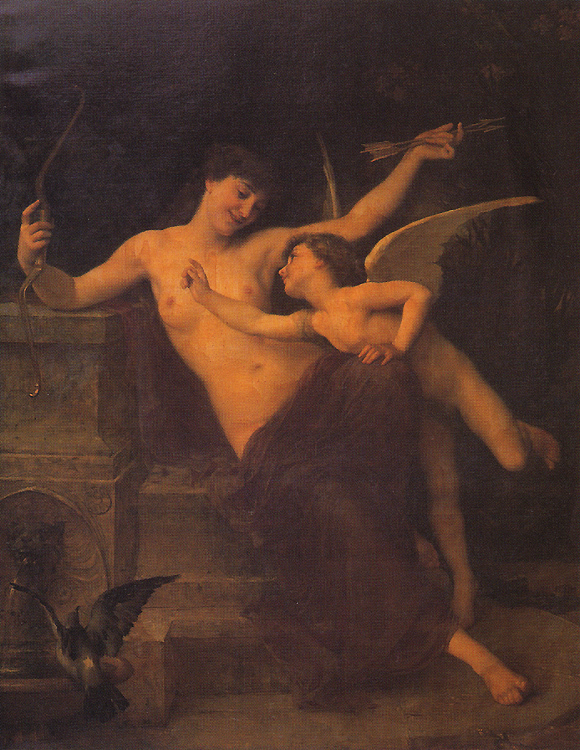 -- "His "Cupid Disarmed" is an instance in point, possessing as it does all the qualities which have rendered the artist a favorite with the public. Venus, at sport with her tricksy offspring, has deprived him of the weapons of which he makes such extensive and often wanton and mischievous use, and laughs at his ineffectual efforts to recover them. Cupid deprived of his weapon is, indeed, rendered harmless, but the time has yet to come when the goddess will actually execute her threat, and convert her jest to earnest."